For those that aren't familiar with my Dr. Harry Oldman posts, they are satirical posts usually inspired by some curmudgeonly statement I saw elsewhere. I try to write blatantly tongue-in-cheek, but with a little bit of truth thrown in for good measure. Yesterday's post was inspired by a representative of a major winery criticizing wines without "classic" heritage. He started his article about differentiating character from flaws. I fully agree that a wine, regardless of its heritage, that has noticeable flaws can be less pleasant to drink or even be undrinkable. The writer then somehow got onto discussing eccentricity in wine and "being different just for the sake of being different." He suggested that such wines are bizarre and people only like them because they're told to like them by somms and "young tastemakers." I know wine lovers and wine professionals who think wine should come from unexpected locations unless it is as good as "the classics." Why grow Cabernet Franc in California or - heaven forbid - Colorado when there is classic Cabernet Franc in Bordeaux and the Loire Valley? Why plant Nebbiolo anywhere but Piedmont in Italy? Why make sparkling wine from anything other than Chardonnay or Pinot noir? Such arguments come from ignorance. Now, I'm not saying that someone thinks Bruno Giacosa produces the finest Nebbiolo on the planet that any other Nebbiolo will change their mind. But, at the same time the preference to one wine region/style should not exclude the production elsewhere regardless if the "bizarre" interpretation bares no similarity to the "classic." I do not expect California wine to taste like French wine, and I also do not expect all California wine to taste alike. Now, what fun would wine be if it all tasted the same way? I think being different just for the sake of being different can be good. Bizarre can be great. Thinking outside the box is what challenges our minds to expand. Outliers not only can last, but they can be paradigm changing. Andy Warhol was controversial artist that gained fame because of his outside-the-box thinking. I'm pretty sure Warhol didn't have only fifteen minutes of fame and faded back into obscurity. In fact, he produced some of the most expensive paintings ever produced. I'm not claiming that all - or any - oddball wines are going to change the wine industry as we know it. Yet, you never know. I'm pretty sure in the 1970s the French thought California wine would fade back into obscurity. Guess what, it didn't and we should embrace quality wines produced from obscure varieties or non-traditional regions. There ought to be a place for them in consumers' glasses if they so choose. Now, picking a California Cabernet for this week's post may seem a bit spurious, but I think a Cabernet Franc from the Russian River Valley fits the bill pretty well. 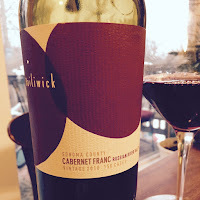 The Bailiwick 2010 Cabernet Franc (13.6% abv, Purchased $28) is sourced from the Alegría Vineyard, a cool location for Cabernet Franc, in a warm part of the Russian River Valley in Sonoma County. The Russian River Valley is known primarily for its Pinot Noir and Chardonnay, and secondarily for Zinfandel. Cabernet Franc tends to be an afterthought compared to its offspring Cabernet Sauvignon in the U.S. Places like Colorado, New York and Virginia have devoted a lot of effort into Cabernet Franc, but Cabernet Sauvignon is still the undisputed king, especially in California. So to see Cabernet Franc produced in a region not known for Bordeaux cultivars is interesting. The Bailiwick Cabernet Franc is not like a Cabernet Franc from Bordeaux, Colorado, Loire, or even nearby Napa. If not for the distinctive green pepper characteristics I might guess this were a Pinot Noir. It is a light red color and has subtle red fruit aromas along with the scent of fresh cut bell peppers. I drank this over two nights. On the first night, the wine was very light bodied with flavors of cranberries, raspberries and those peppers. On the second night, it seemed to pick up some body with dusty chocolate and plum flavors appearing. Overall, this is a fun and unique rendition of a wine that speaks to its Russian River Valley pedigree. Will it convince a wine classist's mind to stop drinking "classic" Cabernet Franc? Probably not. Yet, I am glad there are wines like this one that are capable of showcasing the true diversity of the wine world. Thanks Kyle! We were enchanted with the cab franc from the Alegría Vineyard from the start. With conditions being edgy for that grape, ripening proceeded very slowly in 2010, allowing some really interesting phenolics to develop. And then, being a pinot guy, I used my pinot noir protocols for vinification, so that's why it leans towards that style. Very happy to see how it's evolved over time. Glad you enjoyed it!